◦ Benedetti, Dante Gabriel Rossetti, 250. ◦ Fredeman, Correspondence, 64. 61, 110, 117, 118, 123, 125. ◦ Marillier, DGR: An Illustrated Memorial, 114. ◦ Parry, William Morris, 170. ◦ Radford, Dante Gabriel Rossetti, 19. ◦ Seddon, King René's Honeymoon Cabinet, 1-16 . ◦ Surtees, A Catalogue Raisonné, vol. 1, 101 (no. 175). This collection includes a number of objects in various media, all sharing a similar literary and conceptual context. Although Rossetti's oil painting has received the majority of scholarly attention, the scene was originally conceived as part of a larger project begun by The Morris Firm. In an important sense the received title of this work is misleading. It is properly not “King René's Honeymoon” but “King René's Honeymoon Cabinet”. The work—that is to say, the cabinet—is an effort to construct a purely imaginative object: the cabinet that King René of Anjou might have had commissioned for himself and his second wife Jeanne for their honeymoon. No such cabinet (and no such honeymoon) is either described or referenced in the source text for this work: Walter Scott's late romance (1829) Anne of Geierstein (see commentary below). In its initial conception, this is a collaborative work of ten decorated panels on an oak cabinet depicting features and incidents in the honeymoon of King René of Anjou. DGR designed two of the panels, the large Music panel and the small Gardening panel. Later, in 1864, DGR made a small oil on commission for J. Hamilton Trist. This depicts an uncrowned King René in an arbour leaning forward “across a low chamber-organ on which Queen Isabella is playing, and kisses her. The organ bears the names of the four kingdoms of which René was titular king—Jerusalem, Sicily, Naples, and Cyprus; also a motto in French—using his name for a play on words ‘Born again in God and self’” ( Surtees, A Catalogue Raisonné, vol. 1, 101.). Rossetti also revisited Gardening in 1864, and made it into an independent work, a watercolour entitled Spring. The first version of this work is the cabinet that the architect John P. Seddon had built to hold his professional drawings. As soon as Morris's new “Firm” was founded, Seddon arranged to have his new cabinet decorated by the Morris firm. 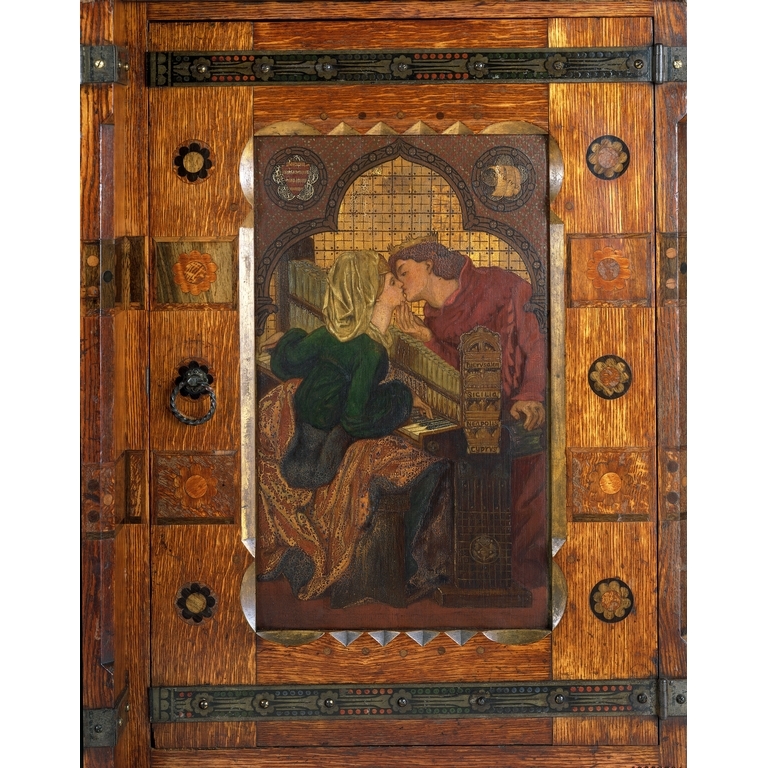 Madox Brown suggested that the design motif should be a series of decorations such that the cabinet might have had had it been King René's honeymoon cabinet. 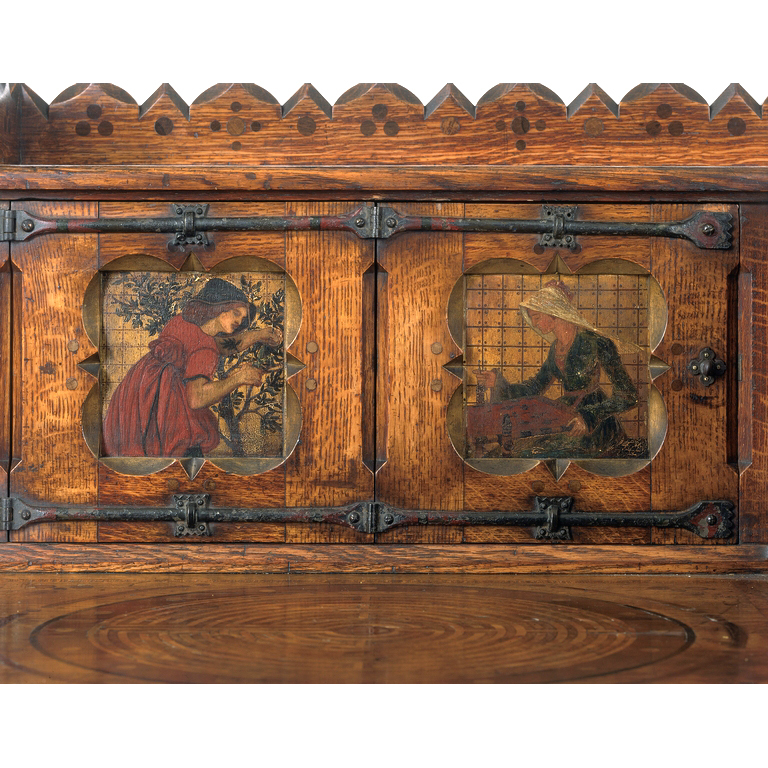 Brown, Rossetti and Burne-Jones designed and painted the decorated panels for the cabinet. In Pollard's own description, these included “cusped arches and corbels at the top, with their spandrels enriched with the armorial bearings in circles, and delicately diapered surfaces and borderings, like those in the medieval manuscripts [Morris] was so fond of; and lastly, by preparing guilt backgrounds for the figures themselves, decorated with diapers of black lines and dots to secure a harmony of treatment throughout”. The next year the same three artists made stained glass designs for the windows now in the Victoria and Albert Museum, which include Music (from a design by DGR), Architecture (designed by Madox Brown), and Painting and Sculpture (both designed by Burne-Jones)—in each case, the same subjects each had taken up for the Seddon cabinet panels. “It is not known for what purpose the glass was made, but it may possibly have been for showing at the 1862 International Exhibition” ( Sewter, DGR's Designs for Stained Glass, 422 ). Later still, in May 1864, Trist visited DGR and asked him to execute an oil painting version of the panel DGR had made. Trist wanted it to match the picture he had made of Madox Brown's cabinet panel. DGR wrote to Seddons some months later and asked him to remove the large cabinet panel that he had done “for Knewstub to copy”. This request was apparently met and the picture was completed on 1 September and given to Trist two days later (see Fredeman, Correspondence, 64.61, 64.110, 64.117, 64.118, 64.123, 64.125 ). Surtees notes that “a copy (not by Rossetti) exists which may have been Knewstub's work” ( Surtees, A Catalogue Raisonné, vol. 1, 101n. ). King René I (René the Good), lived from 1409-1480. In 1419 he was married to Isabel, the daughter of Charles I, Duke of Lorraine. It was an arranged marriage, the king being ten years old and his wife nine. The first part of his reign was largely devoted to public affairs. It was not until after the death of Isabel (1453) that he turned to the cultivation of the arts for which he is so celebrated. This turn dates from 1454 when he married his second wife, Jeanne de Laval, daughter of Guy, Count of Laval. If the honeymoon cabinet is imagined to have any connection to the king's actual life, it would have to be connected to his second marriage, not his first. But in fact the entire work is an imaginative construction built from the quasi-legendary status that the king and his court had acquired. The work develops an imaginative presentation of the king's honeymoon cabinet. The object derives from Walter Scott's story Anne of Geierstein , chapters 29-30, where the character of King René as a devoted patron of the arts is laid out. The king's realm in Provence is represented as a kind of Earthly Paradise, and as such is set in explicit contrast to the worldly kingdoms of England, France, and Burgundy. The panels on the cabinet do not represent scenes from the king's imagined honeymoon. Rather, they are allegorical figurations of the arts that the king patronized. As such, and in DGR's contemporary context, they are second-order symbolic forms, imaginations of what might have been represented on the king's cabinet if it ever existed.